Whenever you start QGIS you basically do it because? Right, because you need to do GIS work. Ah, how I love rhetorical questions to start a post. And most of the time one continues to work on a QGIS project which he has prepared before. For me 99% of the time, I start QGIS, move the mouse to the top left over “Project” go to “Recent Projects” and select the one I want. If I am lucky my hand is stable enough to hover “Recent Projects” and not “New From Template” which I actually never use. 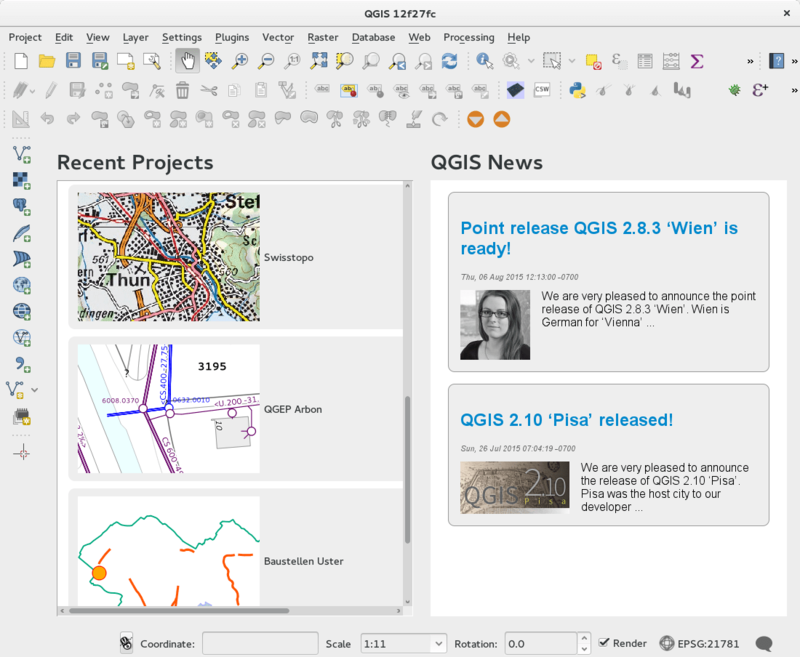 At OPENGIS.ch we just introduced a nice “Welcome Page” to QGIS which lists the recently used projects. With a screenshot next to it! Instead of the filename it will show the project title if one is defined. And you get some recent information about the QGIS project just next to it. I would never want to miss this feature again. Nice feature. That’s the power of open source SW to follow closely the needs of the users. BTW: Can you point to some explanations what QGIS project templates are and how they can be generated? I got one question for you regarding this welcome page feature. How would the project screenshot affect the loading speed of qgis? If there is a way, the most optimal (I think) would be to create a small snapshot every time the project is closing and then the software could use this snapshot, instead of creating a new snapshot every time qgis is loading. You will share a small explanatory tutorial? I think it should be completely self-explanatory, but I’ll be happy to answer questions. Hi Kostas, that’s exactly how it works, whenever you save the project a sample from the mapcanvas is taken. No extra rendering, no performance penalty. The panel will be closed when either the first layer is added or a new project created. I think the entries are saved in the registry on Windows? Can you check if similar entries are generated in the appropriate Windows-Format? Very nice work! I wonder if it’s also possible to show this screen when the user closes a project by clicking the new project button. It would be a convenient way to swap to previously opened projects. It would be very nice to have the possibility to switch back to the welcome screen. It’s a nice job. But how can i get this ? It’s a plugin you created ? How can i hve this on my qgis ? Hi, it’s core functionality which is currently in testing stage. It is included in any recent “development” (qgis-dev) version. It will be included in QGIS 2.12 which will be released later this autumn. So no need to manually install something, just wait for it to appear at your place.